I use ones without windows to store seeds I’ve collected in. I don’t know if the light potentially coming in through the window would make much of a difference but I hate wasting seeds so don’t risk it. One is in the kitchen now, with the shopping list being added to it, as and when we run out of stuff. We’ve always done that – doesn’t everybody..?!? If you open them carefully, you should be able to reuse them. If it’s a plastic window envelope then it’s easy. With the others you’ll need to clearly cross out the address (or use a sticky label over it or something). You can get gummed labels that will go over the open part of the envelope to seal it, and cover the original address. When I’m drilling into a wall, I stick an old envelope underneath to catch the brickdust so it doesn’t go everywhere. It’s not perfect but it helps a lot. If you’re in the UK (which I guess Emanla isn’t but other people might be), you can avoid junkmail in the first place by registering with the Mail Preference Service – http://www.mpsonline.org.uk/mpsr/. I did it for us a few years ago – it only took a couple of minutes and really reduced the amount of junk we get. The only stuff we get now is either direct delivered or from someone we’re a customer with eg, our internet provider wanting to sell us tv services or our bank wanting to sell us wine. Bah. This is not legal and your letter will be returned to you, if your address is on the envelope. Otherwise, it MAY be delivered to your intended recipient with double the correct postage due, since business reply envelopes are only paid for (at double the going first class rate) when the business gets them back from their customers. Collect the “second” envelopes I was talking about as a hobby. Collect enough to fill up a whole brown bag. Then keep them on your curbside for recycling. They make good labels for piles of paper that are trying to find their way to filing (or being dealt with) — very distinctive and, of course, in ample supply. 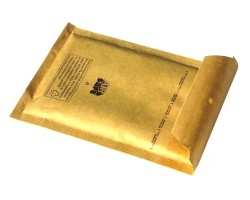 the envelopes are available in various sizes from CD / DVD envelopes, DL, C5 or standard royal mail and larger. My mom used to craft things from brown paper by making paper mache. Also she would make angels “gowns” from crumpled and painted brown paper. Of course it it also good to use instead of styrofoam for mailing material. As our local council paper recycling collections don’t include envelopes (because of the glue) we remove any windows, shred the envelopes and compost them. I have also seen bags of shredded paper offered on freecycle for pet bedding. Before we had a computer and hence some scrap paper, I used to cut the envelopes into sheets of notepad size, then thread them together on string for shopping lists etc. Can you not just remove the sticky flap and window (If applicable) and then put them in the paper recycling? Okay, but if the glue is going to contaminate the recycling, what is it going to do to your compost? How can I recycle the plastic envelopes that the radio Times is sent in, and otheer publications? I have heard there is a place that recycles these but cannot locate it. That’s a good question – I’ll use it as the post on the site tomorrow. I save these to take with me for clearing up after our dog on walks. I also save bags from bread and lots of other things for this purpose, and never have to buy doggie bags. Just check first for holes! I do the same for scooping out the cat litter tray. Emania mentions using prepaid reply envelopes sent by junk mailers with new address labels stuck on and queries the legality of this. 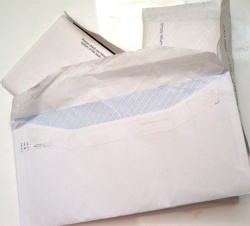 I cannot see that these envelopes are any different to envelopes with a first or second class stamp stuck on them. The junk mail company has, as the name indicates, already paid for the postage, so the Post Office is not losing out. This is quite different to the FREEPOST address arrangement that some reply envelopes have, where the addressee is charged for each one that is franked. Treat them as a gift from your junk mailer, along with the free biro, and enjoy using them! Wrong fiddleback, the junk mail company has not YET paid for those envelopes, as I explained to Emania. them together and there you go – once junk, now a pad of paper! Can’t seem to make the link work. Click on my name to go to the list. You can use clean junk mail envelopes to send notes, money or a check to school with your child. Glue pretty picture on a front, and you can give a small gift in it or a card. Cut envelope in half and store some of your cards separately in your purse, if you don’t use them often. I always use the postage paid envelopes to send a notice back to the company to stop sending me mail. Ha! Bobbie has the right idea! You will soon be taken off that company’s mailing list (it might take a couple of these returned envelopes) because the company actually pays DOUBLE the first class letter rate to receive business reply mail back. by the way, I don’t think it would the legal because you are basically stealing from the magazine. Yes, but the magazine is stealing from you by making you pay council tax to deal with their uninvited and unwanted trash – so, ‘caveat vendor’ I say! I used to resend old envelopes through the post by crossing out the old name and address and writing the new one on the back. However, I am concerned that the old postcode – a series of orange dots – is still visible, and might affect where it is directed. Other than buy sticky labels (in which case I might as well buy new envelopes) does anyone have any ideas? Best way to recycle is to reduce. If you are getting junk mail, sign up to get your name removed from mailing lists so you do not receive them anymore! I keep a little pile in every room for when I’m on the phone or something and need something to write on. When I had hamsters, I would take the less-inky, non-chemical-y looking ones, rip out the little windows and the glue part and throw them in the shredder to make bedding, they used to love it. Can use them in a game of fingerprints. Every participant paints their fingers with water washable paint, then several envelopes are passed around in different directions among the group of players. One of the envelopes is marked on the inside “Murder”. The detective has to guess who was involved with the murder. Decorate them with words and images, flip over the string, glue, and you have a holiday garland. Attach a shoelace and let a little girl decorate her fancy purse. Draw a Christmas stocking on each envelope, and hang over the fire place. Place money gift inside. At work we get a lot of A4 window envelopes and now that sending A4 sized parcels is more expensive, I remake them into a smaller A5 envelopes, just fold in half cut about 2 cm above this line and trim corners and cut one side off and voila you have a new envelopes. Also I use the envelopes I can’t reuse at work to collect my teabags so I can take them home to my compost. For the non addressed junk mail that gets delivered to the door/mailbox, put up a nice sign on door/mailbox with the text “No junkmail, please!” or similar. Paint over the old address on envelopes with black (I use a children’s watercolour “puck”), and when it’s dry write the new address with white marker pen on top of that. Open envelopes with windows carefully in one end using a sharp knife, and when reusing them, just use tape to close them. One could also use a rubberstamp on them with some text about the envelope being reused to save trees, or some such. Coloured envelopes and envelopes with lots of print can be cut up and used in collages – I make all my greeting- and postcards this way. You can put the envelopes with the rubbery glue in the compost as the slugs love the glue and will eat it up! Byt what do I do with the envelopes with bubble wrap inside? It is so securely stuck to the paper that it’s impossible to separate. 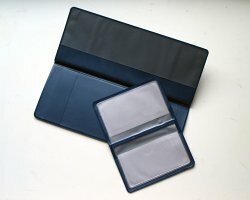 A5 padded envelopes with bubble wrap lining make great low cost Netbook / small laptop cases! I put my old envelopes in the shredder, put them in bags and donate to local animal rescue centres who use them as bedding. You could probably just cut off the glue and plastic bit and recycle the paper. It doesn’t solve all the problem but it solves a good 70% of it. One great craft for the envelopes with the designs inside is paper beads. They are shockingly gorgeous. The envelopes with the designs inside make gorgeous paper beads. Here is a link to some better paper bead images. The envelope beads turn out most like the photocopier paper beads in these images. My concern is the plastic window. Why does it have to be plastic ? Could it not be some kind of biodegradable cellulose ? It’s all very well reusing plastic window envelopes in the various ways described, yet that only delays the plastic content reaching landfill next time around. No one (surely) separates the window out from the paper. I still don’t have a satisfactory procedure for such recycling. But I would welcome one. I use the envelopes with windows to send lunch money to school or notes to the teacher. I use envelopes to make the paper templates for English Pieced Patchwork. The paper is just the right thickness and quality.